We’d love your help. Let us know what’s wrong with this preview of Lights in the Distance by Daniel Trilling. "If you have the right passport, the right amount of money or the right colour skin, Europe can seem like a land without borders. That states who once fought wars with one another now give their citizens the right to travel, trade and work where they like is part of the story modern Europe likes to tell about itself: the EU's founding myth is that it was created to ensure "If you have the right passport, the right amount of money or the right colour skin, Europe can seem like a land without borders. That states who once fought wars with one another now give their citizens the right to travel, trade and work where they like is part of the story modern Europe likes to tell about itself: the EU's founding myth is that it was created to ensure the horrors of the twentieth century were never repeated; freedom, tolerance, and a respect for human rights are now proclaimed as 'European values'. But the movement of people is still tightly controlled. While internal borders have come down, in recent years we have seen the growth of a militarised frontier at Europe's edges to keep out the uninvited. In theory, 'Fortress Europe' exists to protect EU citizens from external threats. In reality, the system itself is a threat to the lives of some of the world's most desperate migrants. As the number of people displaced by conflict worldwide rises to its highest level since the Second World War, an unprecedented number of refugees suffer unnecessary hardship, abuse and even death as they try to reach a continent that presents itself as a beacon of human rights. To ask other readers questions about Lights in the Distance, please sign up. To be a modern European means that you have the opportunity to travel amongst the member countries with little or no identification. Quite amazing to think that this is possible when less than a century ago, we were all at War. That was the last in a series of wars that had taken place on the continent over the past millennia too. Should someone from the Netherlands wish to move to Spain to work they are perfectly entitled to do so. This has gone a long way in ensuring that the horrendous things To be a modern European means that you have the opportunity to travel amongst the member countries with little or no identification. Quite amazing to think that this is possible when less than a century ago, we were all at War. That was the last in a series of wars that had taken place on the continent over the past millennia too. Should someone from the Netherlands wish to move to Spain to work they are perfectly entitled to do so. This has gone a long way in ensuring that the horrendous things that happen back then are never repeated and that human rights have become one of the key values of the European project. 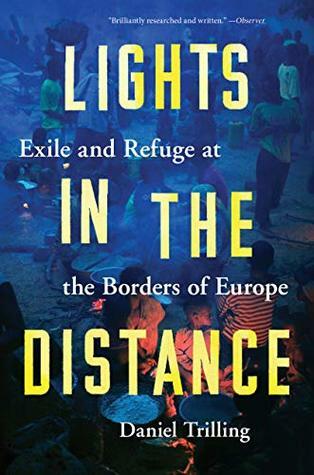 This is a deeply moving book where Daniel Trilling, editor of the New Humanist magazine reports on refugees in Europe. Trilling describes his many years of reporting on the refugee crisis with passion and respect. The number of people displaced by conflict worldwide has risen to its highest level since the Second World War and trilling tells the story of these displaced people and their plight for sanctuary. He does this through visiting camps and detention centres. He visits families and individu This is a deeply moving book where Daniel Trilling, editor of the New Humanist magazine reports on refugees in Europe. Trilling describes his many years of reporting on the refugee crisis with passion and respect. He does this through visiting camps and detention centres. He visits families and individuals to hear and tell their stories. Stories of hunger, abuse, hardship, suffering and death and also stories of hope. He manages to maintain contact with many, as they move from country to country but some disappear and he is left not knowing their fate. Personal accounts of individuals making hazardous journeys across deserts, seas and mountains to the "utopia" of Europe. For some of the masses of people escaping dystopia it is a road of hardship, illness and police brutality. Heart piercing stories of women and children fleeing wars, abandoned in filthy conditions and left to fend for themselves. For some people they eventually make it and claim asylum. For others it's a process of detention centres and rejection. There are those Deeply moving. There are those that make a killing on these Wars. These unfortunate souls are the end result of the designers, planners and ultimately the Politicians of War who fail to make human reason. All these wars have consequences. This book is the face of the refugee. I liked it. I'd say you will too. Very good, very sad account of the life of refugees in Europe and of the system that keeps hundreds of thousands of people without rights in our midst and at our borders. Thorough and patient, -really admirable - interview and research work. Very humane way of telling people's stories. Also very well written.